Reflected below is the Sworn Affidavit to Remove Durham District Attorney Leon Stanback From Office Under North Carolina General Statute § 7A – 66. This affidavit was electronically filed on August 20, 2013, and followed up with the mailing of a notarized original on August 22, 2013. This request to remove this dangerously corrupt criminal (i.e., Stanback) from office was simply dismissed by another long-time friend and colleague of Mr. Stanback -- to wit, Orlando Hudson, who was ALSO DIRECTLY involved in this dastardly scheme of FALSE ARREST, UNLAWFUL INCARCERATION and FRAUDULENT EXTRADITION of an innocent American citizen (Spencer C. Young) on entirely FABRICATED CHARGES that were DISMISSED AS MERITLESS. 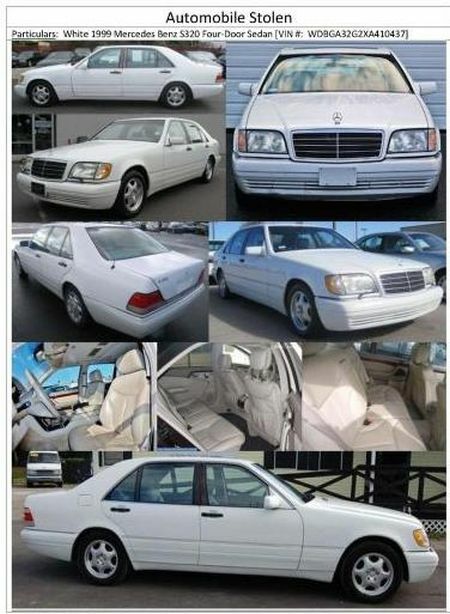 In fact, it was Orlando Hudson who personally signed off on the documents to what was a patently FRAUDULENT and UNLAWFUL extradition of Mr. Young from Florida to North Carolina. 1. I am a resident of Pinellas County, Florida, and formerly resident of Orange County, North Carolina and Nassau County, New York until my family and I were victimized in “the worst bank foreclosure fraud in U.S. history”, a distinction readily corroborated by internet search. I am also the victim of extensive felonies and numerous civil rights violations perpetrated by Durham District Attorney Leon A. Stanback. I allege the facts contained herein are true and to which I have personal knowledge. Instances where allegations are predicated on information and belief are corroborated by overwhelming evidence. 2. Under the provisions set forth in N.C.G.S. § 7A-66, Removal of District Attorneys, I am requesting the removal of Leon A. Stanback from the office of Durham County District Attorney on the grounds stated herein. 3. District Attorney Stanback has committed willful misconduct in office, which is grounds for removal from office under N.C.G.S. § 7A-66(2). 4. District Attorney Stanback has willfully and persistently failed to perform the duties of his office, which is grounds for removal from office under N.C.G.S. § 7A-66(3). 5. District Attorney Stanback has extensively engaged in crimes involving moral turpitude, contrary to community standards of justice, honesty and generally accepted moral standards, which are so extensive and egregious, his conviction is a fait accompli, and therefore grounds for removal from office under N.C.G.S. § 7A-66(5). 6. District Attorney Stanback has engaged in conduct prejudicial to the administration of justice which brings the office into disrepute, which is grounds for removal from office under N.C.G.S. § 7A-66(6). 7. District Attorney Stanback has knowingly authorized an assistant district attorney to participate in the commission of acts constituting grounds for removal from office from office under N.C.G.S. § 7A-66(7). 8. District Attorney Stanback failed to carry out the fundamental responsibilities of his office, namely: protecting citizens and their rights, victim advocacy (e.g., recovering stolen property) and prosecuting those who break the law, and he has profoundly failed in the discharge such duties, as detailed herein. 9. 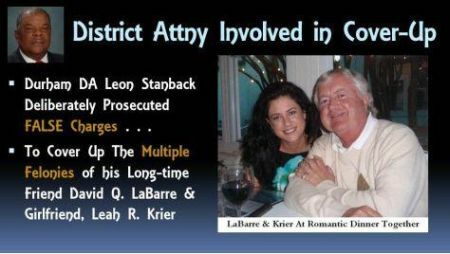 In addition to failing to carry out the core duties of his office, District Attorney Stanback knowingly fulfilled an instrumental role in a nefarious effort to cover-up the criminal activities of fellow "retired" Superior Court Judge, David Q. LaBarre, a long-time friend and colleague of Mr. Stanback's. He did so by prosecuting charges he knew to be false in a disturbing abuse of authority intended to cover up the felonies of Mr. LaBarre and his girlfriend. Leah R. Krier (pictured below). 10. 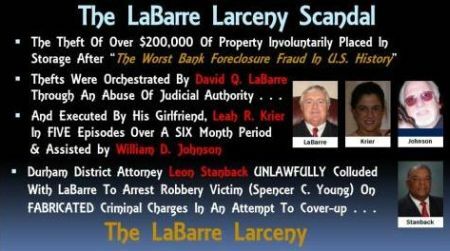 Judge David Q. LaBarre and his girlfriend perpetrated a series of felonies over a six month period (March 2011 to September 2011) which was detailed in a 30 page indictment/complaint electronically filed with the Durham Police Dept. on July 2, 2012, which in turn included hyperlinks to overwhelming evidence of their felonies – this document is incorporated by reference and can be accessed by CLICKING HERE. 12. In lieu of prosecuting the felonies perpetrated by Mr. LaBarre and his girlfriend (captured on security video), Mr. Stanback colluded in the prosecution of false charges against the victim of their thefts (i.e., Complainant) and in an egregious abuse of authority, arrested Complainant at his residence in Florida via heavily armed SWAT team of U.S. Marshals. Complainant was then extradited, tortured, incarcerated in maximum security jail, unlawfully denied bail for 127 days, and denied competent legal representation. 13. 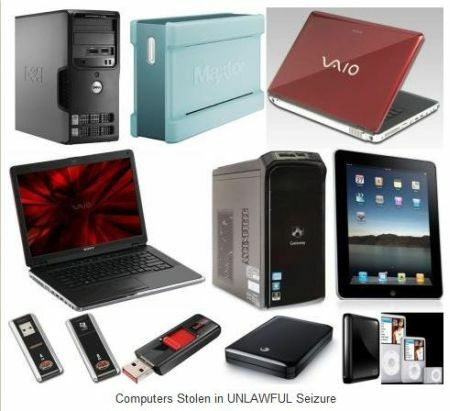 During Complainant’s wrongful incarceration, District Attorney Stanback arranged the unlawful seizure of Complainant’s computers from his Florida residence (see below) with the intent to suppress the damning evidence against LaBarre and his girlfriend, which as of this filing have still not been returned. 14. 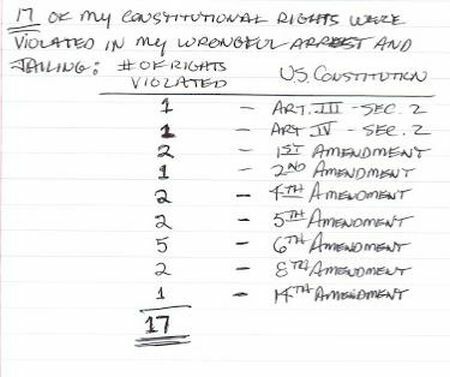 All told, seventeen of Complainant’s Constitutional rights were violated from the reckless and unlawful actions of District Attorney Stanback. 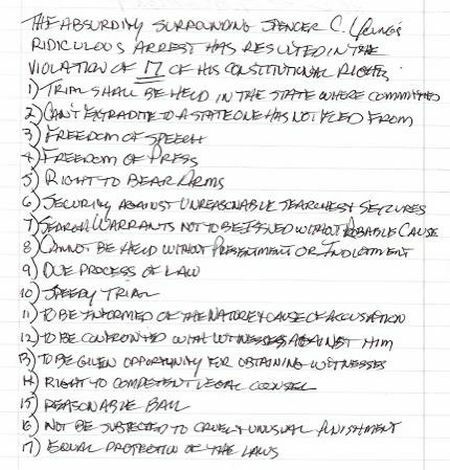 The below handwritten excerpts were compiled while he was unlawfully incarcerated in maximum security jail on false charges that were later dismissed as meritless. a. It is now a well-known fact that the Durham District Attorney (Mr. Nifong) had recklessly and overzealously prosecuted false charges made by a misguided young woman, Crystal Mangum, and incited a scandal of epic proportion and brought shame to Durham; nevertheless . . .
c. Complainant’s eldest son (Michael Young) was victimized by Mr. Nifong's recklessness as a member of the 2006 Duke Men's Lacrosse team – for the entire team of innocent student-athletes were vilified in the media and subjected to frequent death threats, while their coach was wrongfully fired and their season was cancelled – and Mr. Nifong aggressively pursued indictments against three student-athletes whom he knew to be innocent, one of whom was my son’s best friend (Collin Finnerty), and yet . 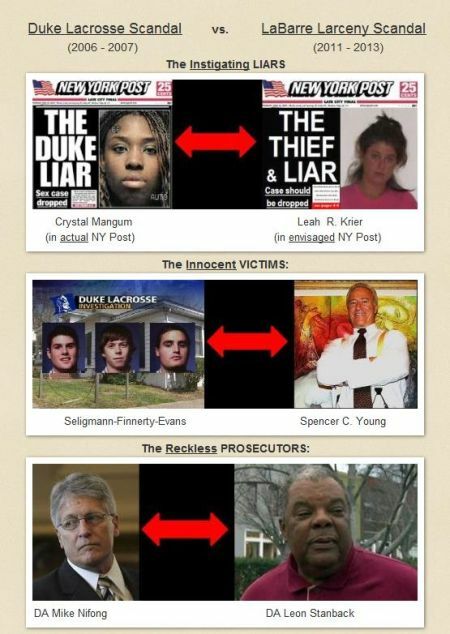 . .
d. Six years after the Duke Lacrosse team’s victimization from the disgraceful acts of Durham’s District Attorney, the Complainant was similarly indicted on entirely fabricated charges comprised of bold-faced lies, which were again recklessly pursued by Durham’s District Attorney, albeit this time it was Leon Stanback, who has again brought shame to Durham. 16. After the fraudulent nature of the charges against Complainant became obvious and the substantial damages had been done, District Attorney Stanback failed to carry out three simple objectives to ameliorate this horrible situation. 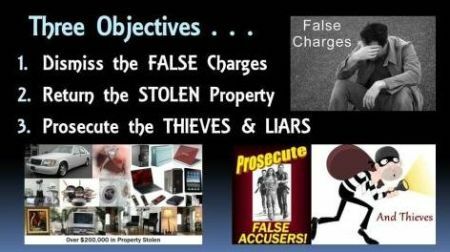 In reckless disregard of his duties and in violation of the U.S. Constitution and operative law, he failed to: (1) dismiss ALL false charges against Complainant; (2) return ALL property stolen by Mr. LaBarre and his girlfriend, including all computers wrongfully seized; and (3) prosecute the thieves and liars responsible for this reprehensible criminal fraud. 17. 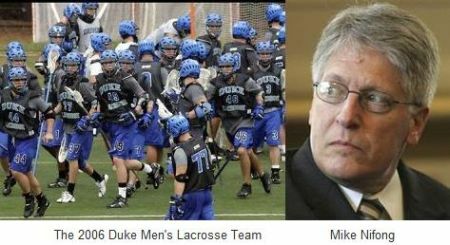 District Attorney Stanback's abuse of prosecutorial authority and reckless behavior in the “LaBarre Larceny Scandal” has been far worse than that demonstrated by Mike Nifong in the “Duke Lacrosse Scandal” because Mr. Stanback . . .
j. Deliberately wasted hundreds of thousands in taxpayer dollars in an elaborate and vicious assault on American civil liberties, as outlined below. 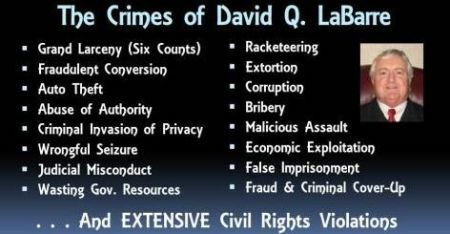 cover-up the felonies of Durham Judge David Q. LaBarre and his girlfriend, Leah R. Krier through the deliberate execution of an unlawful arrest of an innocent U.S. citizen (i.e., Complainant), who was in turn the felony victim of Mr. LaBarre and his girlfriend and thereby fulfilled an instrumental role in a vicious assault on American civil liberties and is therefore complicit in those felonies. 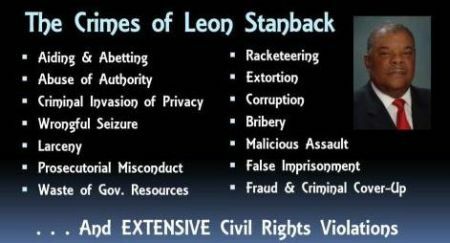 Mr. Stanback’s actions constitute: (i) willful misconduct in office; (ii) willful and persistent failure to perform his duties; (iii) crimes involving moral turpitude; (iv) conduct prejudicial to the administration of justice which brings the office into disrepute; and (v) knowingly authorizing an assistant district attorney to assist in committing such acts – and each such action is grounds for removal. 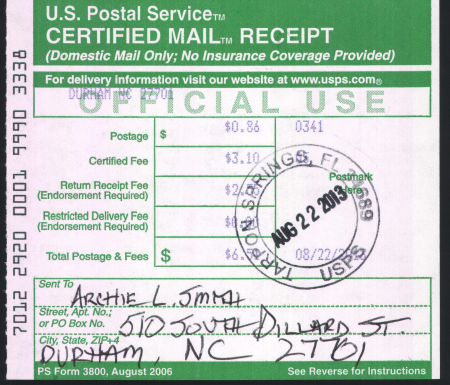 This is my sworn affidavit to remove Durham District Attorney Leon Stanback from office pursuant to North Carolina General Statute § 7A – 66, and I further request that that he and others culpable in the unlawful acts described herein be prosecuted to the fullest extent of the law. 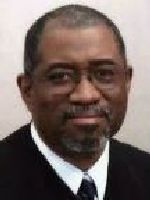 I further request that Durham Superior Court Judge Orlando Hudson recuse himself or otherwise be precluded from adjudicating this matter, as he authorized and signed off on extradition documents that were proven to be fraudulent, and he is therefore implicated in the unlawful activities described herein. Moreover, as extensive instances of corruption in Durham have been personally observed, request is additionally made to have these proceedings overseen by North Carolina Attorney General Roy Cooper and the U.S. Department of Justice. 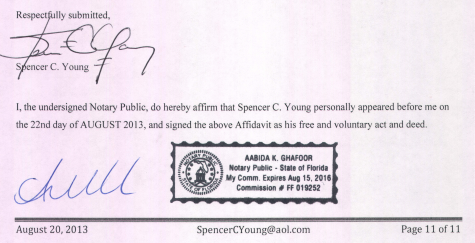 I, the undersigned Notary Public, do hereby affirm that Spencer C. Young personally appeared before me on the 22nd day of AUGUST 2013, and signed the above Affidavit as his free and voluntary act and deed.